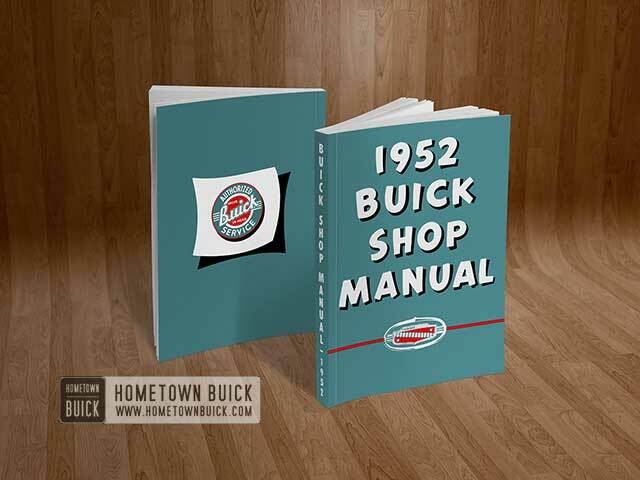 Overall 1952 Buick brake performance cannot be properly tested with the wheels jacked up because this procedure does not test the self-energizing servo action of the brake shoes and the effect of car weight distribution on deceleration. 1952 Buick Brakes should be tested on dry, clean reasonably smooth and level roadway. A true test of brake performance cannot be made if roadway is wet or greasy, or is covered with loose dirt so that all tires do not grip road equally. A true test cannot be made if roadway is crowned so as to throw weight of car toward wheels on one side, or is so rough that wheels tend to bounce. Test 1952 Buick brakes at different car speeds with both light and heavy pedal pressure; however, avoid locking the wheel s and sliding the tires on roadway. Locked wheels and sliding tires do not indicate brake efficiency since heavily braked but turning wheels will stop the car in less distance than locked wheels. The friction between a sliding tire and the road is friction of motion at the point of contact while the friction between a turning tire and the road is friction of rest at the point of contact. Friction of rest is greater than friction of motion, hence, more tire-to-road friction is pre sent with a heavily braked turning tire than with a sliding tire. In addition to roadway conditions mentioned in the previous paragraph, the following external conditions may affect brake performance and should be corrected before work is done on the 1952 Buick brake mechanism. Tires having unequal contact and grip on road will cause unequal braking. Tires must be equally inflated and non-skid tread pattern of right and left tires must be approximately equal. Right and left tires must have approximately the same diameter. Car Loading. When car has abnormally unequal loading, the most heavily loaded wheels require more braking power than others. A heavily loaded car requires more braking effort. c. Front Wheel Bearings. A loose front wheel bearing permits the drum to tilt and have spotty contact with brake shoe linings, causing erratic brake action. Front End Alignment. Misalignment of the front end, particularly in regard to limits on camber and king pin inclination, will cause brake action to appear unequal between sides. Shock Absorbers. Faulty shock absorbers that permit bouncing of car on quick stops may give the erroneous impression that brakes are too severe. Excessive 1952 Buick Brake Shoe Clearance. Excessive clearance is indicated if a good brake is obtained after pumping brake pedal several times. Condition may be caused by wear of brake linings or by a loose initial adjustment of shoes. Adjust brakes (par. 8-12). Fluid Reservoir Empty. If fluid reservoir is empty, a good brake cannot be obtained by pumping brake pedal. Fill reservoir (par. 8-8) and check for springy pedal action (subpar. b, below). Air in Hydraulic System. Air in hydraulic system will cause a springy action of brake pedal. If volume of air is large, the pedal will go to toeboard under normal pressure. See subparagraph b below for causes of air in hydraulic system. Bleed hydraulic system (par. 8-9). Improper Brake Fluid. Improper brake fluid may boil due to high temperature. Flush system and refill with specified brake fluid (par. 8-10). Pedal Linkage Disconnected. Install clevis pin and cotter pin. Air in Hydraulic System. Air will enter the hydraulic system if there is insufficient reserve fluid in the master cylinder reservoir. A disconnected pipe permits air to enter the system. A clogged tiller cap vent will permit air to be drawn in past the piston secondary cup on the return stroke. A leaking check valve causes loss of static pressure in the system, thus permitting air to be drawn in past wheel cylinder cups; if valve leaks badly, it is impossible to “pump up” the 1952 Buick brake pedal. Clean out clogged vent or replace leaking check valve (par. 8-19) as required. Fill reservoir and bleed hydraulic system (par. 8-9). Brake Shoes Not Properly Adjusted. Adjust brake shoes paying particular attention to anchor pin adjustment for centralization of shoes in drum (par. 8-15). Brake Drum Out of Round. Usually indicated by an unstable action of brake pedal. Check brake drums and true up if necessary (par. 8-17). Loose Front Wheel Bearings. Check for play in bearings with wheels jacked up and adjust if necessary (par. 6-14). Loose Brake Backing Plate. Tighten all backing plate bolts and adjust anchor pins to centralize brake shoes (par. 8-15). Brake Shoe s Not Properly Adjust ed. Adjust brake shoes, paying particular attention to anchor pin adjustment for centralization of shoes in drum (par. 8-15). Excessive Dust in Brake Assemblies. When excessive dust is present, brakes are usually more severe in damp weather. Thoroughly clean dust from brake drums and backing plates; sand off brake shoe linings to remove embedded dirt (par. 8-15). Faulty Brake Shoe Lining s or Drums. Charred linings or scored drums cause grabbing action. A small amount of grease or brake fluid on linings may cause grabbing action. Replace linings and true up or replace scored drums (par. 8-17). Brake Shoe Linings Reversed. The primary lining is shorter than secondary lining and of different composition. Install brake shoes in proper positions (par. 8-16). Brake Shoes Not Properly Adjusted. If brake shoes do not have full contact with drums, excessive pedal pressure is required to obtain effective braking. Adjust anchor pins and brake shoes (par. 8-15). Foreign Substances on Brake Linings. Check for grease, brake fluid, or other foreign substances on linings. Replace grease or fluid soaked linings (par. 8-16). Sand off other foreign substances. Improper Brake Lining. Very hard brake lining may have poor braking effect. Install standard Buick lining (par. 8-16). Improper Brake Fluid. Fluid containing substances injurious to rubber will cause swelling of rubber cups in master and wheel cylinders. Replace rubber cups, flush system and refill with specified brake fluid (par. 8-10, 8-18, 8-19). Loose Front Wheel Bearings. Check for play in bearings with wheel jacked up and adjust if necessary (par. 6-14). Insufficient Clearance at Brake Shoes. Adjust brake shoes (par. 8-12). Weak or Broken Brake Shoe Spring. Replace spring and check brake shoe adjustment (par. 8-15). Overhaul wheel cylinder and replace any defective parts (par. 8-18). It is also advisable to flush hydraulic system to prevent repetition of trouble (par. 8-10). Obstruction in Brake Pipes or Hoses. Obstruction may be caused by foreign material, damaged pipe, kinked or deteriorated brake hose. Flush hydraulic system (par. 8-10) or replace damaged or defective part as required. Master Cylinder Compensating Port Closed. If the compensating port is plugged by foreign material, or is covered by the piston primary cup when brake pedal is in released position, high pressure will be maintained in hydraulic system and brake shoes will be held in contact with drums. This condition is indicated by lack of normal pedal travel and a very solid feel when pedal is depressed. Check brake pedal adjustment (par. 8-11). Make certain that pedal is free on shaft and does not bind in floor mat. Replace pedal return spring if weak or broken. If 1952 Buick brake pedal adjustment does not correct the trouble, remove master cylinder for disassembly and thorough cleaning (par. 8-19). CAUTION: Never insert a test wire through compensating port as this may leave a burr which will cut a groove in piston primary cup. (3) Wheel Cylinder Piston Cups Distorted. If the rubber parts in master cylinder are found to be swollen and distorted (step 2, above), it indicates the presence in hydraulic system of a mineral base oil such as kerosene, gasoline, or engine oil. Such substances will cause all rubber parts to swell and distort, therefore it is usually necessary to thoroughly flush the hydraulic system (par. 8-10) and replace rubber cups in wheel cylinders (par. 8-18). Tires Unequal. Tires unequally inflated, or having unequal wear of treads or different non-skid tread designs may cause car to pull to one side when brakes are applied. Inflate all tires to specified pressure (par. 6-8). Re-arrange tires if necessary so that tread non-skid characteristics are more nearly equal on both sides of car. Brake Shoes Improperly Set. Although hydraulic brakes are self-equalizing so far as applying pressure at each brake shoe in concerned, the brake shoes will not hold equally if not centered in drums, or if the wear pattern is not uniform on all four shoes. Adjust anchor pin and brake shoes (par. 8-15). Out-of-Round or Scored Brake Drums. True up or replace as required (par. 8-17). Brake Linings Not Matched, or Improperly Placed. Brake linings must be of same composition on left and right sides of car, otherwise unequal braking action will result. If primary and secondary linings are interchanged at any wheel, unequal braking will be obtained. Replace or change linings as required (par. 8-16). Foreign Substances on Some Brake Linings. Any foreign substance on linings will affect braking action. Thoroughly clean any linings having water, sand, paint, imbedded particles of metal, etc., on surface. Sand or brush the affected surface-do not use any liquid cleaning agent. Linings having oil, grease, or hydraulic fluid on linings cannot be cleaned satisfactorily and must be replaced (par. 8-16). Loose Brake Backing Plate. Tighten all backing plates and adjust anchor pins to centralize brake shoes (par. 8-15). Unequal Camber. If car has a tendency to lead to one side when driven on a level road it will also pull to one side when brakes are applied. Adjust camber to specified limits (par. 6-30). Brake Shoes Not Properly Adjusted. Adjust brake shoes, paying particular attention to obtaining uniform clearances and correct anchor location (par. 8-15). Brake Drum Condition. Carefully inspect brake drums for out-of-round, scoring, cracks, or hard spots. Rebore any drum if out-of-round or scored (par. 8-17). Replace any drum which is cracked or has hard spots in braking surface. (3) Foreign material Imbedded in Lining. Metallic particles or grit imbedded in brake lining will cause squeaking. Sand the surfaces of linings and remove all particles of metal. In some cases it may be necessary to dress the lining surfaces with a portable resurfacing machine in order to properly clean the surfaces and insure good contact with brake drums. Linings Loose on Brake Shoes. Replace any rivets that are loose. Lining must be tightly held against brake shoe flange, particularly at the ends (par. 8-16). Bent Brake Backing Plate. True up or replace backing plate. Improper Brake Shoe Lining. Install standard Buick Lining (par. 8-16). Shoes Scraping on Backing Plate. Squeaking or “crunch” will be produced if contact surfaces are dry, rusty, or rough. The noise is more pronounced if brake shoes have considerable movement due to large clearance between shoes and drums. Clean, smooth up, and lubricate contact surfaces and reduce shoe movement by adjusting to safe minimum clearance (par. 8-15). The condition known as “fade” is caused by loss of friction between brake linings and drums as a result of abnormally high lining temperatures. Excessive heat cooks out the most volatile ingredients of the bonding material in lining and this acts as a lubricant. The effect is similar to the loss of brakes resulting from water on brake linings. Excessive lining temperature will be produced by partial or spotty contact of linings with brake drums, due to improper adjustment. Excessive lining temperature also can be caused by frequent and heavy braking at high speed, driving with parking brakes partially applied, “riding” the brake pedal, or prolonged use of brakes on steep grades without using second gear (synchromesh) or low range (Dynaflow) to obtain adequate engine .braking. After a set of brakes have faded a few times it is probable that they will continue to fade even though the shoes have been adjusted to establish full contact of linings with drums. This is because the cooking out of bonding ingredients has destroyed the frictional properties of the lining surfaces. If the lining thickness is ample and the cooking process has not been prolonged, it may be possible to obtain a correction and some useful life by grinding off about .020″ from the lining. Merely sanding off the lining surface will not remove destroyed lining material. If this cannot be done, replacement of lining and proper adjustment for full contact is the only remedy. The use of improperly compounded linings will also produce fade. Some replacement linings lose their frictional properties at lower temperatures than the linings selected for Buick brakes. Such linings must be replaced to effect a correction. When brake drums are rebored too thin they will have excessive expansion due to heat. The result is loss of pedal reserve and braking when drums are hot, and good brakes when drums are cold. This may be erroneously diagnosed as fade, but fade occurs with ample pedal reserve.